At the launch event of Samsung Galaxy Note Pro 12.2, the Korean giant churned out a cheaper version of it that lacks S Pen capabilities, and called it Galaxy Tab PRO 12.2. Rest of its specifications are similar to the Note Pro 12.2 tablet. 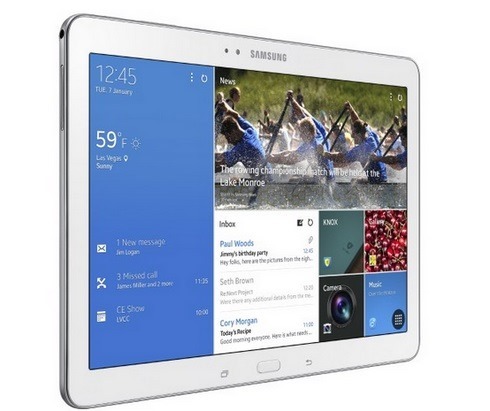 The Samsung Galaxy Tab PRO 12.2 is equipped with a Super Clear LCD display which runs Android version 4.4 KitKat operating system on screen with WQXGA (2560 x 1600 pixels) resolution. Computing power is pretty impressive too as Sammy has equipped it with Exynos 5 Octa / Snapdragon 800 CPU (International / US), which is backed by the 3-gigabyte of RAM to keep everything run smoothly. For storage, the manufacturer has installed 32 / 64 GB internal eMMC flash storage that is expandable via a micro SD slot that supports cards up to 64 GB. It will be available in black or white (shown below). 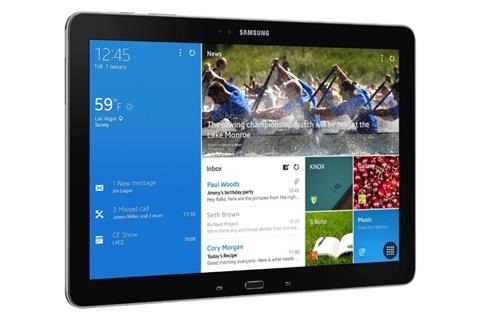 Other Samsung Galaxy Tab PRO 12.2 Specs include 8-megapixel main camera capable of recording video clips in full HD, 2 mega pixel webcam, dual band 3G / 4G LTE radio (Snapdragon 800 version), infrared port, Bluetooth 4.0, USB 2.0 port, GPS receiver with A-GPS + GLONASS, and battery capacity of 9500 mAh.